Twenty years into her career, Anne Hathaway is used to being cast a certain way. But at first glance in ‘Serenity,’ Steven Knight’s noirish thriller, opening on January 24 in the UAE, Hathaway’s character appears to have spent her lifetime catering to the pleasures of men. As Karen, Hathaway makes a jaw-dropping entrance — long blond tresses and soul-crushed eyes, a femme fatale in white — in the only bar on Plymouth Island. 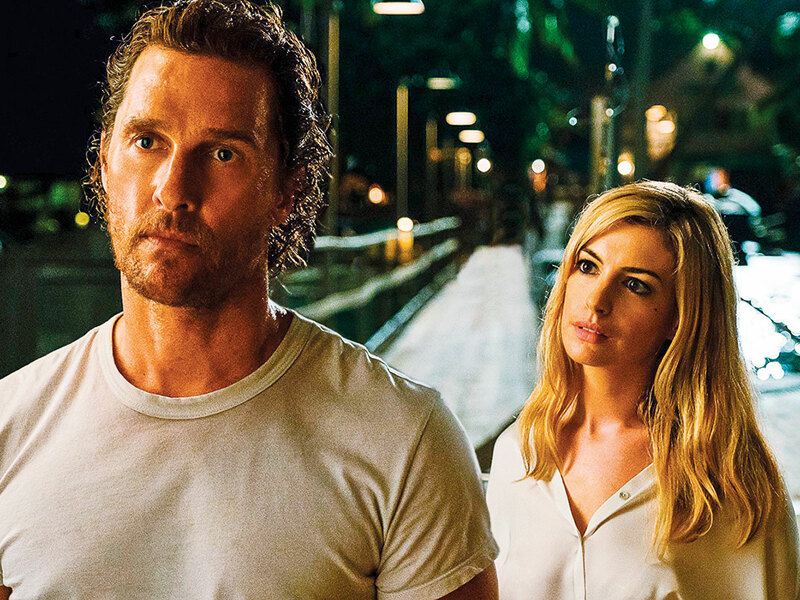 And she has a proposition for her ex (Matthew McConaughey), a struggling boat captain: Take her violent new husband (Jason Clarke) out fishing, then drop him in the ocean for the sharks, in exchange for $10 million (Dh36.7 million). It’s the first entry in a big year for Hathaway, who stole the show from Sandra Bullock and Cate Blanchett in last spring’s ‘Ocean’s 8.’ Come May, she’ll appear in ‘The Hustle,’ a female-centric remake of ‘Dirty Rotten Scoundrels’ with Rebel Wilson, followed by ‘The Last Thing He Wanted,’ Dee Rees’ adaptation of the Joan Didion novel about a reporter turned arms dealer, and ‘Modern Love,’ an Amazon series spun from The New York Times column. When she’s not on set, Hathaway, 36, lives in New York with her husband, the producer, actor and jewellery designer Adam Shulman, and their son, Jonathan, 2 3/4. (“He’s like butter,” she said, sighing deeply. “Those moments they cuddle up into you just because they want to.”) Calling from a family vacation spot somewhere north of Los Angeles, Hathaway spoke about the actresses who still floor her and Hollywood’s echo chamber of men. Q. Karen is a dramatic pivot from the roles we’re used to seeing you in. Were you immediately game? A. I was very surprised when I got the script for ‘Serenity’ and found out that Steven wanted me. I was just very honoured and couldn’t wait to roll up my sleeves and dye my hair. Q. We know that secrets lurk on Plymouth Island, and there will be no spoilers here. But what was your reaction to the script when you first read it? A. It knocks you. I was on the edge of my seat. I couldn’t wait to turn the page and see what was coming next, as it became more surreal and thrilling. I really love being a part of provocative movies that require a certain muscularity from the audience, a certain level of mature film viewership. One of my favourite things about ‘Serenity’ was how provoked I felt by it both in my mind and in the pit of my stomach. A. You know, I never thought I’d be able to say what I’m about to say: I did it for the fun of it. It just seemed like it was going to be a blast, and it mostly was. A. I was a little bit too assured in my confidence that I’d be able to convince the powers that be that my character shouldn’t be British, she should be American. I thought I was going to win that one up until the day before filming. So then I was tasked with doing the thing that is the hardest in the world for me, which is pulling off a British accent. All of a sudden it went from feeling like you had a rocket strapped to your back to feeling like you’re on a tightrope and there was no net. Q. You seem to enjoy a comic thrill ride, like Daphne Kluger, the narcissistic actress in ‘Ocean’s 8.’ From what demented place did you conjure her up? A. Well, it was fun to apply a lot of observation that I’ve made over the past 20 years or so about the incredibly ridiculous world of celebrity — to send that up with my tongue firmly in my cheek. She was just such a trip. I loved playing someone who was so transparent and yet so blind to herself. Q. You went into ‘Ocean’s 8’ saying, ‘Do not embarrass yourself in front of your heroes.’ What on earth were you worried about? A. Oh, I think I was worried that everyone would like each other and secretly not like me and I’d just be kind of outside of it. In the past I’ve let my excitement get the best of me, and I just wanted to sit back and enjoy the experience and not try to fill it with my own enthusiasm but to take in how truly glorious it was to be in the presence of so many queens. Q. You’ve often told the story of how nervous you were around Meryl Streep in ‘The Devil Wears Prada’ — and here I am, suddenly feeling rather tongue-tied around you. Q. But seriously, is there anyone now who could possibly intimidate you? A. Yes. I burst into tears when I met Julia Roberts, and it wasn’t like 20 years ago. It was recent history. It’s a strange thing to find yourself right smack dab in the middle of a place where you are not born, where you have no reason to imagine yourself and yet somehow there you are. It sometimes produces — how do I say this? — weirdness and awkwardness. And I’m learning to just say thank you and not make such a fuss about it and have a good time. Q. You’re one of the more than 300 women in film, television and theatre involved in the Time’s Up initiative. What’s your take on the movement’s accomplishments this past year? A. All I can represent is my own experience, which is I was ignorant of all the effort that has gone into keeping women separated. And now that I’ve found my sisters and my arms are linked with them, I’m never letting go. Q. On Instagram, you cited a recent study that found that female-led films earn more than ones starring men — and yet pay inequity is still a huge issue. A. The reason I think that there’s resistance is that Hollywood has been full of men who would describe themselves as good, but who have been in echo chambers full of other men who look and think like them. This doesn’t make these men bad, but it does mean that the conversations being had at the highest levels of power are, by default, limited. Q. Looking back at your 2012 Oscar-winning turn as Fantine in ‘Les Miserables,’ I was reminded that you have an impressive set of pipes. Are you singing much these days? A. My son hates my voice. [Peals of laughter] He doesn’t like it when I sing. So no, I’m really not. There’s a couple ‘Peppa Pig’ songs he lets me sing and man, I lean into those so hard. Serenity releases in the UAE on January 24.